Professing a commitment to equity is now a political necessity -- something that Ram Manohar Lohia advocated years ago, says Rajni Bakshi. An overwhelming majority of people who pass by the Lohia Hospital in Delhi probably know little, or nothing, about the man after whom the facility is named. Do a Google search with the words 'Ram Manohar Lohia' and what shows up on top are two hospitals and a university. So it is not surprising that the birth centenary of India's firebrand socialist leader went by virtually unnoticed, last week. Prime Minister Manmohan Singh paying floral tributes to Lohia's portrait in Parliament but that is clearly not considered much of a photo op. 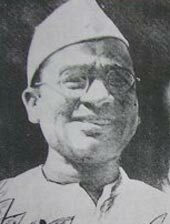 If it was not for the faithful Press Information Bureau we would have no public record to show that Parliamentary leaders remembered Lohia on his hundredth birthday. Neglect of Lohia seems perfectly natural at a time when 'socialism' is widely regarded as an outdated, even regressive, ideology. Zealous followers of Lohia would consider it a mockery that Manmohan Singh garlanded Lohia's portrait, since the prime minister is seen as the chief architect of India's shift towards a corporate-favoring capitalist economy. To their ears the government's claims, about working for 'inclusive growth' and 'inclusive markets', ring hollow. And yet those claims are a subtle victory of the historical legacy in which Lohia appeared. That is why professing a commitment to equity is now a political necessity. Anyone who supports a system which disregards the disadvantaged cannot hope to build a career in public life, let alone electoral politics. So this fleeting moment of remembering Lohia is a good occasion to acknowledge how much our present owes to the values he was associated with. In order to do this we may have to resist flippant or casual use of the terms 'socialism' and 'capitalism'. Then we can attempt to decipher reality more dispassionately and thus perceive common ground -- even if such ground takes the shape of islands amid a sea of bitter contestation. Born in a village of Uttar Pradesh in 1910 Lohia was deeply influenced by Mahatma Gandhi. Lohia was just 10 years old when he participated in a satyagraha action for the first time. Educated at Calcutta University and later Berlin University, Lohia wrote a PhD thesis on the Salt Satyagraha. Later, he was one of the founders of the Socialist Congress Party, within the Indian National Congress. He spent long spells in British jails where he was tortured. He bitterly opposed the partition of India and later wrote a controversial book titled, The Guilty Men of India's Partition. Lohia regarded Marxism as the 'last weapon of Europe against Asia'. He rejected both Marxism and Capitalism by expounding 'the Principle of Equal Irrelevance' because proponents of both ideologies depended on big industry and centralized systems. Lohia warned Americans, back in the early 1950s, that their lives and American democracy itself, would be taken over by large corporations. Lohia was part of an intellectual stream in which socialism meant not control over the means of production by the State but an open society in which the creation of wealth, while important, was contained within democratic processes to ensure equity and justice. This form of socialism was primarily committed to forging systems of free exchange anchored in cooperative structures and humane values. Thus Lohia opposed moves that would put more and more power in the hands of governments. After Independence, Lohia spent the rest of his life encouraging public involvement in the infrastructure of development -- including community endeavours to construct canals, wells, roads, et cetera through voluntary labour. He also helped to set up the 'Janvani Day', when people from across the country could come and present grievances to Members of Parliament. Sixty years later 'people's participation' is a commonly accepted goal -- however inadequately applied. Above all, Lohia fought for equality of opportunity, another contemporary mantra. However, in the 1950s and 1960s it was a radical proposal that institutions must actively ensure that so-called lower castes and economically backward classes be given preferential treatment to ensure that they can overcome historical disadvantages in order to acquire skills and resources. Lohia blamed the caste system for India's historical setbacks because it fostered narrow identities and prevented people from seeing themselves as citizens with wider responsibilities. His solution was not a war against the upper castes but a campaign to urge privileged people to 'voluntarily serve as the soil for lower castes to flourish and grow.' This needed to be done not merely on grounds of humanism, Lohia argued, but because it was the only way to release a broad spectrum of talent and ideas. Though Lohia died in 1967 his political footprint was powerfully visible in the youth movement inspired by Jayaprakash Narayan in the mid-1970s -- when hundreds of thousands plunged into political action with slogans in praise of 'Gandhi, Lohia, Jayaprakash'. Ironically, most of the mainstream political leaders which emerged from that movement and claimed to be 'Lohiaites' -- notably Mulayam Singh Yadav, Lalu Prasad, Sharad Yadav -- built careers on 'castism' of the kind that would have pained their ideological mentor. Lohia's legacy is alive through the values that now cannot be challenged -- equity, participation, transparency, accountability. Yes, these values are violated more often than honored. But treating these values as basic entitlements is a vital shift, and evidence of this is scattered across both public life and recent literature such as Nandan Nilekani's Imagining India and William Bissell's Making India Work. Lohia-inspired socialist activists, still working passionately at the grassroots, may have bitter disagreement about the details of these models. Then there are those who are dedicated to a more just and equal society -- and genuinely outraged by the 'ovarian lottery' that gives perpetual advantage to the already privileged. But many of these change-seekers are allergic to what they have identified as 'socialism'. For instance, the powerful economist and policy maker Raghuram Rajan is famous for a book, titled Saving Capitalism from the Capitalists. He opposes the tendency of capitalism to become a system 'of the incumbents, by the incumbents, for the incumbents'. This view is an example of those islands of common ground referred to earlier. It is fascinating to speculate what new conversations might open up if such apparent opponents sailed across the chilly waters of bitter contestation and met on such islands of common ground. The death threat to Gori Gana!